June is Adopt a Cat Month and I’d like share an unusual adoption story. Feral Flashback: Revisiting Operation Domino. 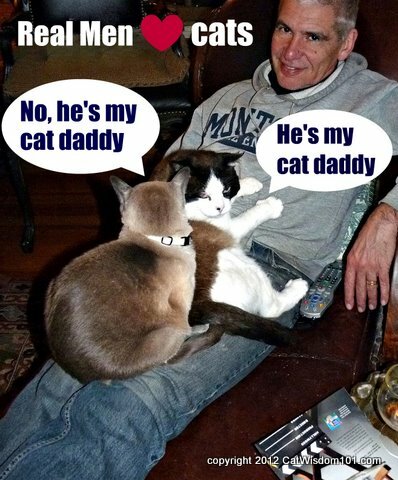 It shows that there are as many ways to adopt as there are cats. Shelters are my #1 choice for adoption but cats have many ways of finding us. This time two years ago, our former feral cat Domino lived outdoors. For seven years he made our porch his home but refused to come inside. Somewhere in his past, he learned humans were not to be trusted. He arrived out of the blue one day, a starved and gangly teen, his tail broken in two places, tooth chipped and an ear torn. He looked part Snowshoe but it would take time for his beauty to emerge. We didn’t know he came from or where he was going. For whatever reason he decided to stay put but certainly not owned. He appreciated the cozy nest and regular meals onhis new porch “home” but no one could get anywhere near him. Touching was out of the question. Then late last spring, he got very ill with a deep abscess in his front leg. He limped in misery. The antibiotics in his food weren’t working like they had in the past. A wily survivor, he’d thwarted every attempt to trap him but we knew the prognosis wasn’t good if he didn’t get medical attention. Our mobile vet came to the rescue in Operation Domino (a revised version below this post) and saved his life. He’s come a long way and this “before and after” speaks volumes. He was the feral who mistrusted humans and averted their gaze. His fur went from scruffy to silky and his personality blossomed from fearful to loving. His confidence soared and his days of being on guard 24/7 melted into contented bliss. 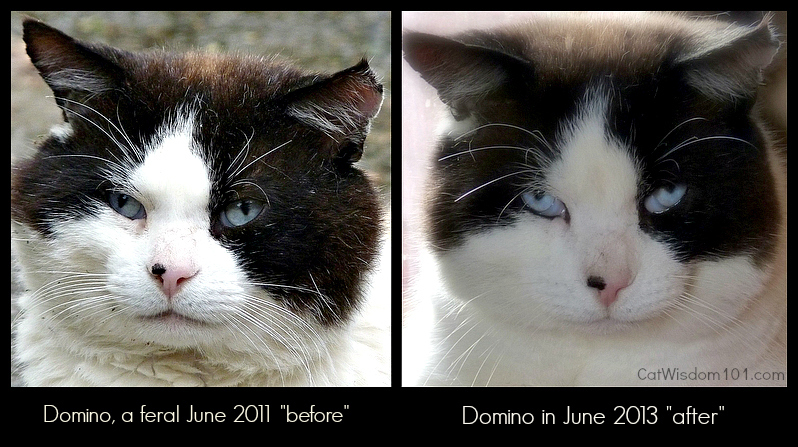 Domino’s story gives hope to other ferals and strays if given a second chance. 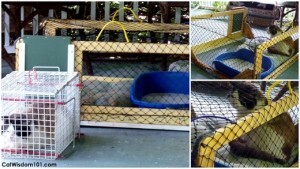 Operation Domino: Capturing A Feral Houdini – June 16, 2012. They say it takes a village to raise a child, but what about cats? 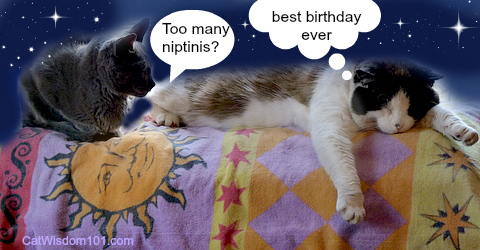 After recent events concerning Domino, one of our Cat Wisdom 101 cats, I’ll wager a yes. Over a month ago, Domino, injured his leg. He’s feral and not a stranger to abscesses. Usually, a course of antibiotics administered in his food and he’s good to go, but not this time. His left leg ballooned and he developed a limp. Two weeks of antibiotics and no improvement. Something had to be done. For years he’s eluded the best traps and schemes for capture. He’s a smart and wily survivor, a mind reader and Houdini rolled into one furry package. A couple of weeks ago we finally lured him inside a large carrier. Slam! The door locked, we high-fived and waited for our mobile vet to arrive. Just as suddenly, Domino found his inner Hercules, rammed against every corner until a bolt loosened and he blasted out to freedom. Undaunted, we knew we needed help for Operation Domino requiring a village. 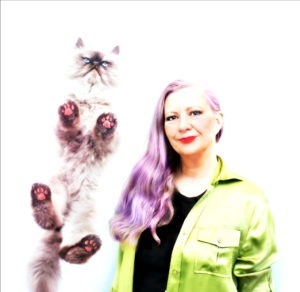 Ingrid King our dear friend from Conscious Cat did long-distance Reiki. I did Reiki and other energy healing from as close as he would tolerate. Jackson Galaxy sent his homeopathic essence for stress and Feral Cat Rehab. My private healing group via super intuitive Laura Day sent healing. Our mobile vet Rich Goldstein from Mobile Vet Squad agreed to come on short notice. Countless friends and fans rallied support. At one point, he seemed to improve after the abscess burst and drained, but he still wasn’t putting any weight on his left foot. It was time to have a serious talk with him but would he listen? 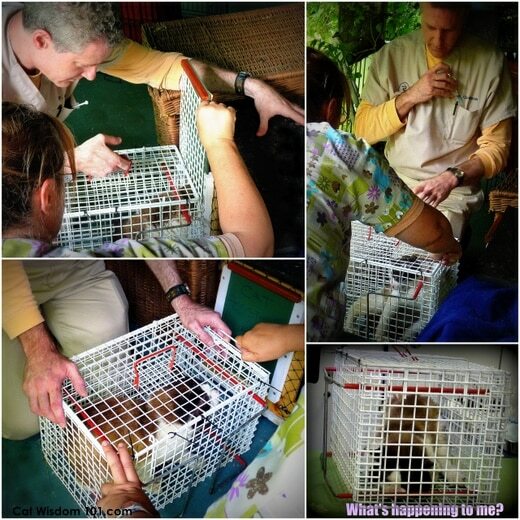 Dr. Goldstein and vet tech Lisa, expertly transferred Domino from the drop drop into the transfer cage. Odin our one-eyed cat watched wide-eyed through the window at the commotion. Dr. G. attending to Domino in the fully equipped mobile clinic. Now the three-hanky diagnosis: Domino’s leg was dislocated and the massive infection had spread to all the bones in his leg. It’s a wonder he was able to hobble about. The abscess was lanced and drained but will require 8 weeks of antibiotics and then re-examined. Wish us luck capturing him again for another x-ray. Worst case scenario if the antibiotics don’t work? Amputation. Oh, and he’s FIV+. Domino came out of his anesthetic naturally and recuperated for a few hours in the drop trap on the porch. I did some more Reiki on him and then went inside to work. I figured he be safe overnight in the large trap but Domino had other thoughts. By the time Dr. G called at six to check up on him, Domino had pulled another Houdini. Thankfully our helper cat, Gris Gris slipped outside with me and I asked him to help me find him. Sure enough, he led me straight to Domino hiding under a covered lounge swing in my secret garden (a favorite spot of his). I brought his dinner but he took one look at me and ran away. Maybe he felt being trapped was more than he bargained for. After all, I never mentioned neutering as being part of the bargain. Sometimes it does take a village to help one cat. I’m grateful for the healing miracles waiting in the wings, perhaps from you? Let’s envision Domino running on all fours again playing with his pals again. Cat Wisdom 101 isn’t the same without him. Update: Food rules this survivor. The next day Domino returned to his domain, the porch where all his favorite foods were served on demand. Within two weeks, he returned to his former self and by the end of seven weeks of antibiotics, he made the second biggest decision of his life: he decided to come inside. Wary at first, we kept the front door wide open as he gradually explored one room and then darted outside. Every day he explored further afield until he’d sniffed every corner of the ground floor. He’d stare round-eyed at the strange black box with sounds and moving images and the stairs befuddled him. Any sudden movement from me or unexpected noise and he’d bolt out the door. Coaxed with treats, he eventually he felt safe enough to climb up to the second and then third floor. The litmus test was closing the front door and then keeping him in overnight. By the time the cool fall weather approached he faced the prospect of either another miserable winter outdoors or a cozy one indoors. You can guess what he chose. A feral who eluded any kind of touch for years, made up for lost time by becoming a lap cat who makes biscuits and drools in ecstasy every day. 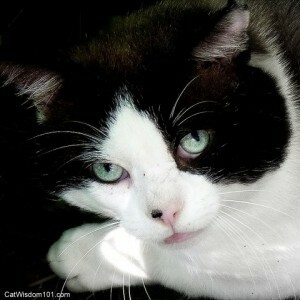 Domino loves his cat daddy and is deeply bonded with all his fur brothers. He still insists on going outdoors every day but never ventures farther than the garden and prefers sleeping on soft duvets at night. It’s been a long journey for this survivor and he’s a testament to the power of healing, love, community and patience. Such a beauty boy. I have a few converts from feral life here, too. They have “come out” as wannabe house cats and not really feral at all. Those blue blue eyes, could be lost in them I do believe. That is such a transformation. I am glad Domino was eventually caught and is now so obviously enjoying life. The softer thing is very true even if they haven’t made the full transition indoors. My gang no longer has to find food or shelter and they are “fixed” so the constant need to protect and add to territory is less as well as the procreation drive. 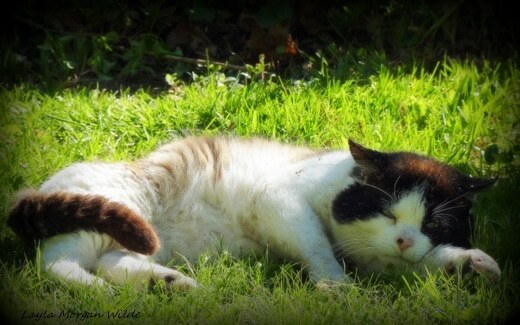 It allows them to just be cats and relax and play and enjoying the taste of their food and lay in a sun puddle and just breathe………………..We are making progress every day with the oldest one and the shyest one. Concats to the contest winner! So glad you’re making progress. It’s a day by day thimg and a joy to see them relax without being in survival mode 24/7. Wow, I better not tell Odin ;-0 and thanks. Love the story and the before-and-after photographs. Lots of cats that people think are feral born, have actually lost their homes and forgotten how to trust humans. 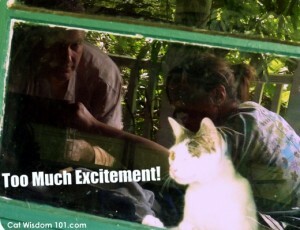 It takes a big heart and a lot of patience to teach the cats to love again, but it’s so worth it! I’m voting for you, Layla! Domino what a magical transformation. We are glad your inner cat told you to accept the open indoor invitation to live safely forever. You deserve to be happy and healthy and so well loved. So glad Domino found you and you were able to help him. He sure is a handsome guy. I voted for you. I’ll be sure to tell him, thanks Sue. 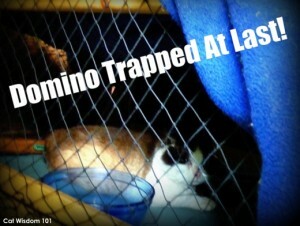 That is a wonderful transition and I am so glad that Domino decided to let you help him and be his family!!! Wow! What a fantastic difference. Domino, you are so much more handsome now! Even our sister Tessa took notice of your photo and gives your current picture a full paws up! dood…havin lived on de streets me furst yeer eye can ree late….glad ya gave up street livin for a for evers home…eye noe eye will never go bak…did ya looze yur ear tip in a TNR attempt or yur mom thinks may bee a fite ??? heerez ta a grate week oh end two all !! Domino lost the ear tip about a year after he arrived probably from frostbite and fights. I can see very clear difference! 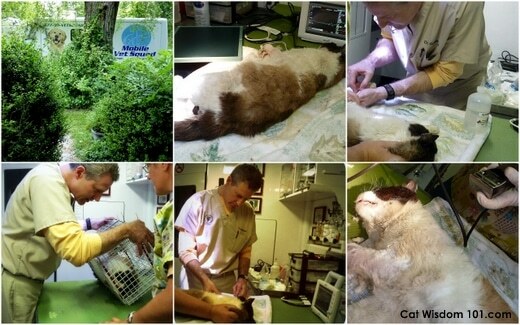 You gave so much love and care for Domino, and he is a very happy kitty now! Yup, Domino has always been one of our favorites. We are so glad that he comes inside now. You do look good Dom. So glad you have such a good home. Hope all of you have a great week end. It really is amazing the difference a bit of time and lots of TLC made. I remember how scruffy, dirty and matted Chumely was when I adopted him, and just two months later he was the picture of health. The contrast then, even in a short time, was amazing. We’re all so glad Domino found such wonderful humans to care for him. It is nice to see the difference between 2011 and today. It should never be the other way around! Purrs and cheers for Domino! Dom, you are a changed man. You look happy and content — and handsome, as always. That’s exactly it! He’s softer inside and out. Domino, although you gave the humans no small amount of trouble catching you, I get the feeling that when you finally let them, you were really ready to leave your feral life behind. Paws up to you!